Clears “Wall Acne” It’s not unusual to see the walls of kitchens and baths blanketed with huge banks of light switches. There are two problems with this setup: it’s difficult to remember which switch controls which group of lights and the numerous faceplates eat up a big chunk of wall space. Lighting keypads, by contrast, provide six to eight pushbuttons that can control all of the lights and take up only the space of a single-gang junction box. Creates Activity-Based Preset Lighting Levels Each pushbutton on a keypad can be programmed to set the intensity level of a predetermined group of lights, called a lighting “scene.” For example, a morning button on a kitchen keypad can brighten the under cabinet lights to 50 percent and the fixture over the island to 30. A cleaning button can raise every light to full intensity, and a romantic button can lower the lights to an intimate 25 percent. Likewise, in the bathroom, specific lights can adjust on the fly based on whichever button is engaged: morning, night, relaxation, and so on. smart systems design and installation by Global Custom Integrations, Hawthorne, N.Y.
Showcases Decorative Details The wood grain of fine cabinetry, the mix of colors of a granite countertop, and other visually stunning architectural details look even better with the right lighting. A lighting designer can choose the best light source, fixture and placement, while a home systems installer can suggest the best levels of brightness. Improves Comfort With standard, non-smart lighting, the lights can feel blinding during midnight trips to the bathroom or the kitchen. A smart lighting system ensures that the lights are easy on the eyes during certain hours of the night. Adds an Element of Automation Imagine having the kitchen lights set at the perfect level when you arrive home from work. It’s possible with a smart lighting system. Driven by sophisticated microprocessors, it can adjust the lights automatically based on conditions like the time of day, occupancy, and even the location of your smartphone (a feature called geofencing). Personalizes the Space Some people like a room brightly lit; others prefer at atmosphere that’s soft and subdued. A smart lighting system has the intelligence to set the lights based on who’s at home. Sets the Mood The biggest trends in home lighting are color and tunable white light. Smart LED bulbs are available that can glow in a rainbow of hues. This is all controllable through a mobile app, keypad, or even voice commands. The bathroom can bask in a sea of blue to promote relaxation; a red hue can evoke a festive atmosphere when entertaining guests in the kitchen. 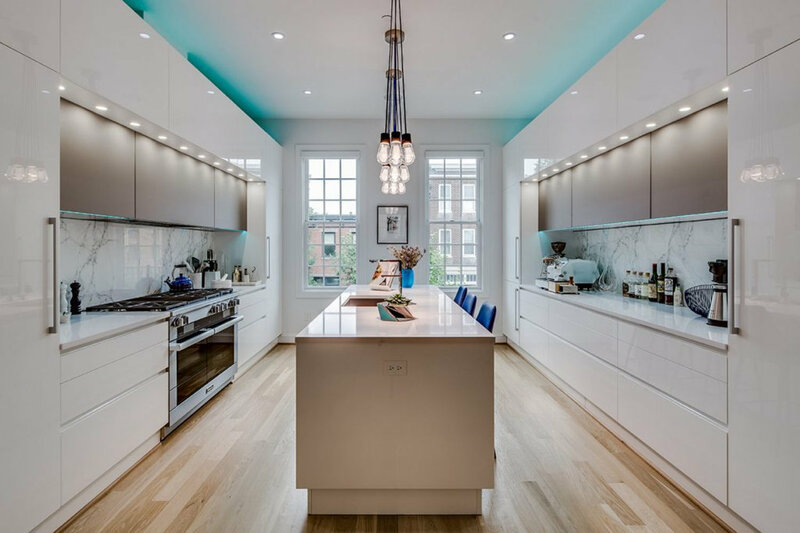 If infusing the kitchen and bath with colored lighting seems too drastic of an approach, a subtler mood-setting alternative is “tunable white lighting.” These LED bulbs adjust their color temperature—as well as their brightness levels—to mimic daylight patterns. This can have a huge impact on the look and feel of the kitchen and bath. Boosts Energy Efficiency Dimming a light by 25 percent can cut electricity costs by 20 percent, according to Lutron Electronics. You can save even more if that light source is an LED, which uses significantly less electricity than an incandescent bulb. LED bulbs also last years longer—a huge perk if the kitchen or bath has hard-to-reach light fixtures. smart systems design and installation by Gramophone, Timonium, Md. 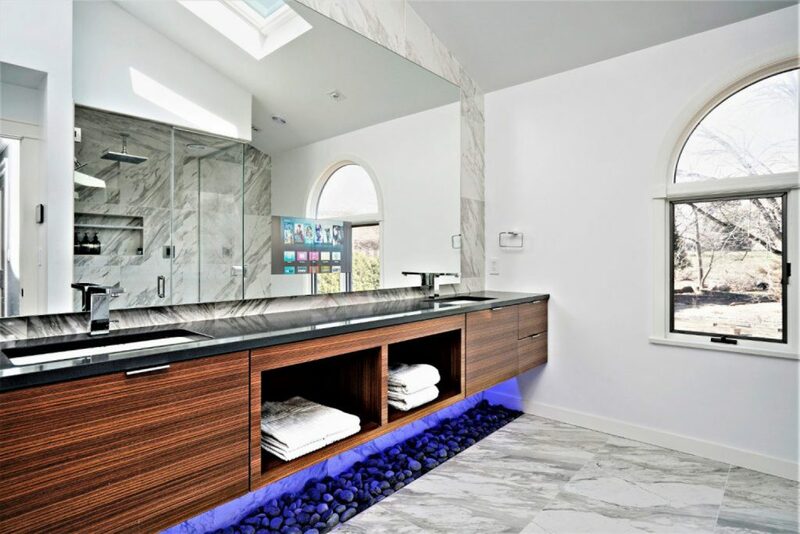 Synchs with Music and More Lights can go a long way toward setting the mood of a room; when a smart lighting system has been programmed to synchronize with a music system, the kitchen and bath can take on a whole new attitude. Classic music can play when the lights are dim; hip-hop when they are bright, for example. This can be easily accomplished by pressing a single button on a keypad or launching a command from a mobile app. A security system, thermostats, and motorized shading can be integrated, as well, to completely alter the atmosphere of the room. Provides Peace of Mind Nobody intends to leave the lights on when they leave the house or go to bed. 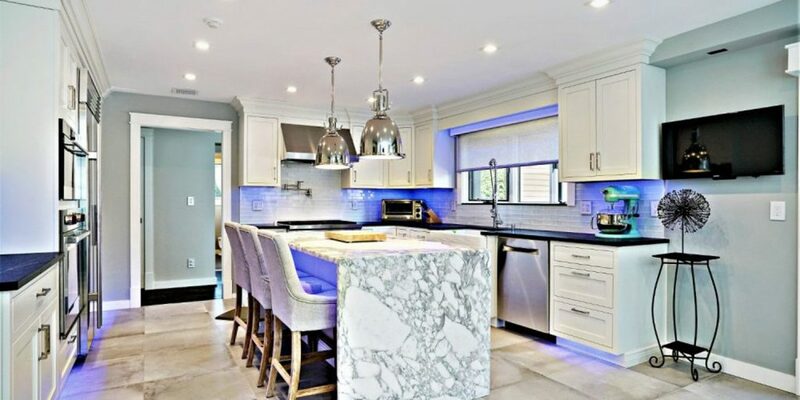 Lighting systems can be access and controlled remotely from a mobile app, so that the kitchen and bath are always illuminated (or not illuminated) perfectly. ← CAN SMART HOME TECHNOLOGY REDUCE HOME INSURANCE RATES?